Paweł Aleksander Pawlikowski (Polish pronunciation: [ˈpavɛw alɛˈksandɛr pavliˈkɔfskʲi]; born 15 September 1957) is a Polish-British filmmaker, who has lived and worked most of his life in the UK. He garnered much acclaim for a string of award winning documentaries in the 1990s and for his feature films Last Resort and My Summer of Love, both of which won a BAFTA and many other European awards. His latest film, Ida, won the 2015 Academy Award for Best Foreign Language Film. Pawlikowski was born in Warsaw, to a father trained as a doctor in the army and a ballerina mother. In his late teens, he learned that his paternal grandmother was Jewish and had died in Auschwitz. At the age of 14, he left communist Poland with his mother for London. What he thought was a holiday, turned out to be a permanent exile. A year later he moved to Germany, before finally settling in Britain in 1977. Pawlikowski grew up a Catholic and considers himself one up to this day, but says that he finds the Catholic Church in Great Britain to be easier to grow in faith in than that in Poland. Pawlikowski was a Creative Arts Fellow at Oxford Brookes University from 2004 to 2007. He teaches film direction and screenwriting at the National Film School in the UK and the Wajda Film School in Warsaw. In addition to his native Polish, he speaks six languages including German and Russian. Pawlikowski's wife developed a serious illness in 2006 and died several months later. They have a son and a daughter. After his children left for university, Pawlikowski moved to Paris, and later relocated to Warsaw, where he lives close to his childhood home. In the late 1980s and 1990s, Pawlikowski was best known for his documentaries, whose blend of lyricism and irony won him many fans and awards around the world. From Moscow to Pietushki was a poetic journey into the world of the Russian cult writer Venedikt Erofeev, for which he won an Emmy, an RTS award, a Prix Italia and other awards. The multi-award winning Dostoevsky's Travels was a tragi-comic road movie in which a St Petersburg tram driver—and the only living descendant of Fyodor Dostoevsky—travels rough around Western Europe haunting high-minded humanists, aristocrats, monarchists and the Baden-Baden casino in his quest to raise money to buy a secondhand Mercedes. Pawlikowski's most original and formally successful film was Serbian Epics (1992), made at the height of the Bosnian War. The oblique, ironic, imagistic, at times almost hypnotic study of epic Serbian poetry, with exclusive footage of Radovan Karadžić and General Ratko Mladić, aroused a storm of controversy and incomprehension at the time, but has now secured it something of a cult status. The absurdist Tripping with Zhirinovsky, a surreal boat journey down the Volga with the Russian would-be dictator Vladimir Zhirinovsky, won Pawlikowski the Grierson award for the Best British Documentary in 1995. Pawlikowski's transition to fiction occurred in 1998 with a small 50-minute hybrid film Twockers, a lyrical and gritty love story set on a sink estate in Yorkshire, which he co-wrote and co-directed with Ian Duncan. In 2001 he wrote and directed Last Resort with Dina Korzun and Paddy Considine, which won a BAFTA, the Michael Powell Award for Best British Film at Edinburgh and many other awards. In 2004 he wrote and directed My Summer of Love with Emily Blunt and Natalie Press, which won a BAFTA, the Michael Powell Award for Best British Film and many other awards. In 2006, he filmed about 60% of his adaptation of Magnus Mills' The Restraint of Beasts when the project was halted—his wife had fallen gravely ill and he left to care for her and their children. In 2011, he wrote and directed a film loosely adapted from Douglas Kennedy's novel The Woman in the Fifth, starring Ethan Hawke and Kristin Scott Thomas. On 19 October 2013, his film Ida (starring Agata Kulesza) won the Best Film Award at the London Film Festival, on the same night that Anthony Chen, one of his National Film and Television School pupils, won the Sutherland Prize for the Best First Film, for Ilo Ilo. Ida won the 2015 Academy Award for Foreign Language Film on 23 February 2015, the first Polish film to do so. 1 2 "Kto Ty jesteś? Paweł Pawlikowski o filmie "Ida"" (in Polish). Onet.pl. 18 October 2014. Retrieved 28 February 2015. 1 2 Bloom, Livia (5 May 2014). "Courage of Conviction: A Conversation with Ida Director Pawel Pawlikowski". Filmmaker. Retrieved 28 February 2015. ↑ "Pawel Pawlikowski: 'I was a lost guy in a weird city'". The Guardian. 18 September 2014. Retrieved 28 February 2015. ↑ Screenonline. Accessed 2014-05-26. The title of Erofeev's novel (or prose poem) has been variously translated, but Pawlikowski's documentary is in English and is titled in English. ↑ Pawlikowski, Pawel. "Filmography". 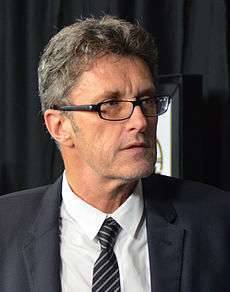 Pawel Pawlikowski — Writer and Director. pawelpawlikowski.co.uk. Retrieved 26 May 2014. ↑ "A Quick Chat With Pawel Pawlikowski". kamera.co.uk. ↑ Dawtrey, Adam (20 September 2007). "Pawel Pawlikowski takes on Stalin". Variety. Retrieved 21 March 2011. ↑ "Ethan Hawke, Kristin Scott Thomas top 'Women' – Thesps to star in indie thriller based on novel". Variety. ↑ "Master and Pupil honoured by LFF on the same night". UK Screen. October 20, 2013.